Battle Defence Line (or as we spell it here in America: Battle Defense Line) is an iPhone game with a unique twist to the first person sniper genre. This is a real-time-strategy war game where you, the commander, can summon soldiers of different levels or vehicles to attack an invading swarm of enemies. You have the ability to snipe at enemy soldiers by tapping on them in order to support your troops and after completing a level, you get money to upgrade and level up your troops and equipment RPG style. Released by Nextail, Defense Line is available for $1.99 on the iPhone, iPod touch, and iPad. Games in general always have the huge hurdle of trying to be unique but not becoming alien to most gamers. You can only innovate so much before people just give up and say “I don’t get it.” There also comes the problem of always trying to come up with something new. That is why most games combine different genres into a single game. Battle Defense Line combines the RPG leveling and unit building of Strategy War games with a first person arcade sniping game. Does the combo work? Does it make for great success? Well, its super close in my opinion. At first glance, the gameplay is simple to pick up. You have your gun, you tap on little tiny enemies twice to make them fall over and die. As you progress a few levels, you get the ability to summon troops out. You can still snipe faster than the troops can move to an attacking range. Then you hit the level where they introduce the tank. Game play shifts to panic-tapping on the tank and the army of soldiers begin to get bigger. They are coming in range and you are suddenly realized what those spawnable troops are for. The game shifts from simple shooter to full out crowd control. It’s almost like a tower-defense game, but too bad we can’t influence the spawned units. They instead move forward automatically and fire by themselves. Your job is to shoot and create more of them. It’s amazing how the flow of the game shifts with each wave of newly introduced enemies. I especially appreciated that the enemies weren’t going to stay microscopic for the rest of the level; they were just really far away. The graphics are okay. Most of the level is gray while the units are little blotches of green and tan. The big appeal is the number of troops you can have on screen at the same time, which I believe, can hit about 30 to 40, though by the time it hits that high, I’m usually dead. I liked the controls since the targeting reticle is far enough away from your finger to allow you to see where you are shooting. The sound has a military feel to it, almost like a Metal of Honor epic-ness. It’s a unique take on the classic World War II game genre. 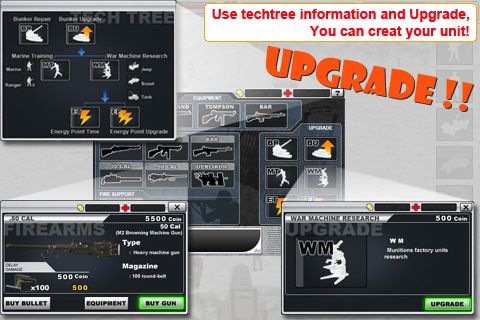 Battle Defence Line is a great challenging game with lots of upgrades and weapons to purchase. The gameplay changes and evolves well and the genre combination really meshes. At $1.99, this is a heavy duty game that stands on its own. More levels, more weapons, and more updates for this first-version app and this game will probably be better received than most WWII games released on console or PC market. 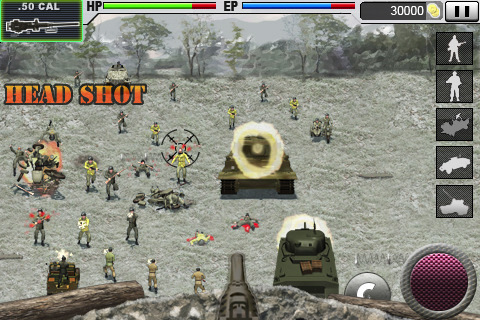 AppSafari review of Battle Defence Line was written by Joseph Ho on September 16th, 2010 and categorized under App Store, First Person Shooter, Resource Management, Strategy. Page viewed 4266 times, 2 so far today. Need help on using these apps? Please read the Help Page.